A co-worker found these books and they are so cute! 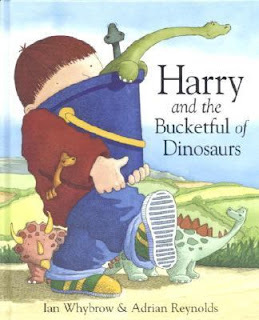 Harry finds dinosaurs in his grandmother's attic and decides they would rather live in a bucket than a box. He carries them in his bucket throughout many adventures and books by Ian Whybrow. I was charmed by Harry and his bucketful of dinosaurs and equally charmed when Harry went to the museum with his family and bucket in tow. Harry's sister is looking for their ancestors, the Romans, and Harry finds his dinosaurs ancestors too! Annabelle is a fan of these books too. Last night we were reading about Harry and at the back of one of the books were pictures of the dinosaurs and their names with pronunciation. I was pointing to each and saying, "Stegosaurus, Tyrannosaurus," etc. She points to one and says, "What's that saurus?" Oh she is such a hoot! I love the conversations we have while reading. Thanks for stopping by my blog and saying hello! It's always great to meet someone new!! Have a great weekend! I am going to have to put these on our library queue. I have a little boy who is absolutely enthralled with dinosaurs right now! I am so glad you stopped by my blog today so that I could find yours! Thanks for stopping by The Craft Cave. You have a wonderful blog. I am your newest follower. Have a great weekend. These books look really fun. I have a friend whose little boy loves, loves, loves dinos. He would dig these books. Love the top book. My youngest Grand would love these! Fabulous! I love these books too! They were a favorite when I taught preschool. Thank's for stopping by my blog yesterday for New Friends Friday! 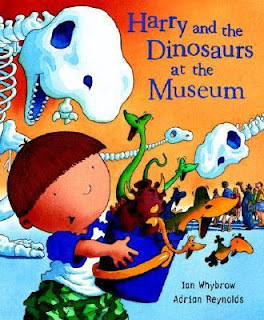 I enjoyed this post about Harry and his dinosaur discoveries! Bubs loves when we read him books, I'll have to check these out! My daughter would LOVE these books - I'll be adding them to our ever growing list of books to read. Thanks for sharing!